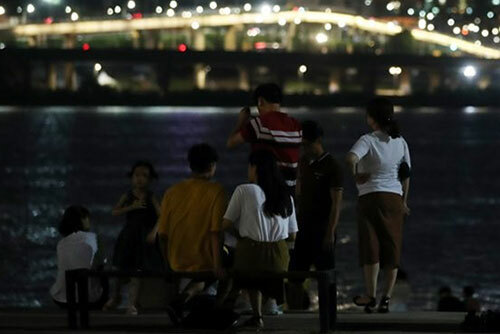 Seoul experienced its second consecutive super tropical night on Thursday as the mercury reached a record 30-point-four degrees overnight through the early hours of Friday morning. According to the Korea Meteorological Administration, the figure broke the previous record high recorded just the day before to become the highest to be posted since the capital began weather observation in 1907. Super tropical nights are when temperatures exceed 30 degrees Celsius from 6 p.m. through 9 a.m. the following morning. Though afternoon highs on Thursday were slightly lower than Wednesday’s, overnight temperatures increased by point-one degree. Seoul has been seeing tropical nights for 13 days now. Such sweltering nights have continued for 17 days in Busan, 16 in Yeosu, and 14 in Gwangju and Daejeon. The weather agency forecast that with most parts of the nation placed under a heat wave warning, afternoon highs on Friday will reach over 35 degrees. In particular, the agency said the mercury will shoot up to over 38 degrees in Seoul and some other inland areas on Friday and in inland regions in North Gyeongsang Province on Saturday.